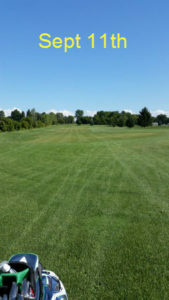 Our third annual Living with CF Golf Tournament was held on Saturday, September 12, 2015. 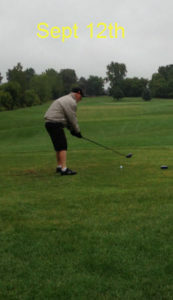 CFFC continued its tradition of challenging our supporters with both the game of golf and the vagaries of Rochester weather. 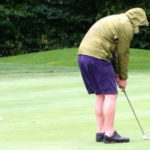 The gorgeous weather during the preceding week produced a perfect example of “you should have been here yesterday.” Despite cool temperatures and a light (but steady rain), 19 intrepid golfers completed the 9-hole competition. 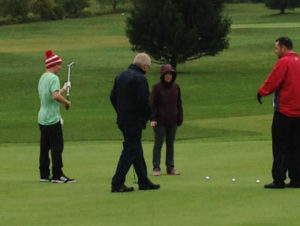 The demanding conditions did not inhibit the drive to respectable scores. The smiles and good humor throughout the day proved that our participants enjoyed themselves. 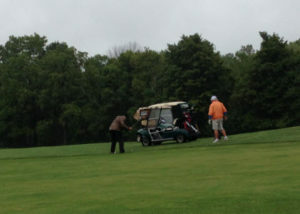 Rick Doherty, Chris Cirslak, Mike Baird and Steve Maloney with a score of 31. Tom Skavienski, Laura Skavienski, Kevin Wetmore and Anthony Terrigino with a score of 32. Dave “Fitz” Fitzgerald, Nathan Dederick, Jeremy Cranker and Keith Kauffman with a score of 33. Walt McCanna, Harland Stoddard and Tom Wickerham also with a score of 33. The staff at Southern Meadows provided a great venue for our tournament. Mike Clawson, the club pro, was our official scorer; Rick Clawson served as our chef and Dan Park ensured that the course was in tip-top shape. Donna Germuga and Sue Smith helped with set up and clean up as well as being our roving photographers. Kori Tolbert, CFFC president, offered the official thank you to our participants and an analogy comparing our inclement weather with the disappointments encountered in a life with CF. Greg Smith served as tournament chair and chief weather worrier. Our tournament is more than a social event; it is also our primary community fund raiser. We appreciate the continued support we receive from our sponsors in both cash and merchandise. Please check out the Golf Sponsors 2015. Here are a few more pictures that show golfers in action, demonstrate the range of outfit choices and offer proof of player satisfaction.